Before USB microphones were a thing – this question wasn’t simple and there wasn’t a simple answer. Now – you add USB microphones into the mix and the answer becomes even more complicated. However, I can offer up my experience. First of all – everything is possible. I’ve talked with hundreds of voiceover artists, talents, actors etc and every single person has a different method and different microphone, studio, setup etc. Literally EVERY single person has something different. I have a friend with a USB microphone hooked up to a laptop in her closet – and she books more professional voiceover gigs than my other friend that has a $10,000+ studio built in his garage – complete with sound proof tiles, extra insulation etc etc. I myself have 3 different setups that I use now. I have a studio with 2 traditional condenser mic’s- complete with phantom power supply hooked up via XLR to a mixer board and then cables from that into my soundcard on my computer. That is what I have used for years doing voiceovers. It has worked wonderfully. However – the issue with it is that as it ages – it get’s more difficult to troubleshoot since there are a lot more connections/moving parts to the setup. So, a few months ago I decided to try out a USB microphone. 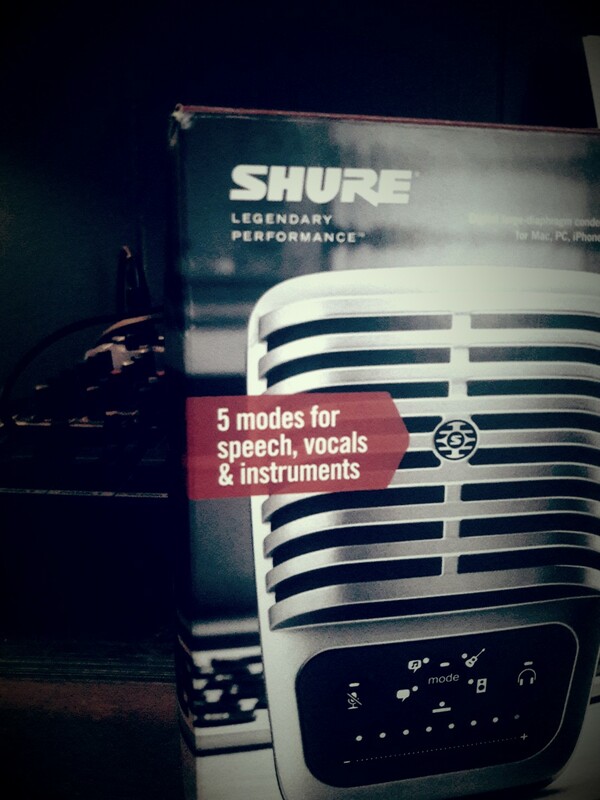 I did some research online and decided on the new(er) SHURE MV51 USB condenser microphone. Skeptical about how it would compare to my already professional setup. I plugged it in and began playing with the settings. I recorded several different demo scripts and played with some post-recording processes in Adobe Audition to see how I could make it sound. I was pleasantly surprised. About that time – I had a lengthy order come in for a voiceover for an online training course. Roughly 4 hours of voiceover. I decided I’d give it a shot using the USB microphone. I recorded it – sent it off and success – Client was thrilled! Since then – I have been using the SHURE USB microphone for 95% of my work. It has proved to be more than worth the roughly $200.00 that I spent on it. There are still some recordings where I will opt to use my other setup – I’ll explain why below. But it’s proved good for most of my recordings and would actually probably work for all of them. In fact, I made the money back and then some in one day after buying it – by recording a voiceover I would NOT have gotten had I not had this USB microphone. I was traveling one weekend when an order came in for a Chevrolet Trailblazer advertisement that HAD to be recorded that day. If I couldn’t record it that day – they would use somebody else. Well – I had my laptop and I brought along my USB Shure microphone. There in a roadside hotel I opened my laptop, plugged in my USB Shure microphone – set up the small portable stand it comes with – and set it in the middle of my suitcase still full of clothes. I quickly downloaded Audacity on my laptop and recorded the script. I did a very brief edit job in Audacity and sent it out to the client. They loved it. In fact, they couldn’t believe when I told them where I recorded it. It earned me great props from the client who was very happy that I could record it for them – on a weekend – on short notice. And – it got me paid in a magnificent way. Money I would have lost had I not had the Shure USB mic. At times, I feel it lacks some of the subtle clarity’s that my other microphones pick up. However, if you are good with Adobe Audition or other post-recording audio editors – then you can generally make up for those losses. Otherwise – you might want a more traditional setup for that other 1% of recordings. Certainly not necessary unless you plan on doing some major Hollywood and National spots in the near future. In these cases – you could probably book some time in a studio or they may have you come to their studio anyway. The shape – doesn’t work with my traditional mic sleeve/pop filters that I have which required me to get a different pop filter setup. Not a big deal – but just be aware of it. I got my USB mic off of Amazon after doing extensive research. 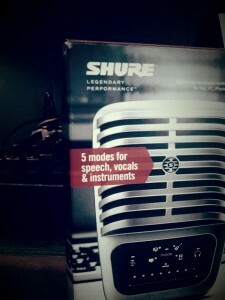 Here’s a link if you’d like to the SHURE MV51 if you’d like to check it out.